What does it mean to be an Anglican Christian? Anglican Christians are part of a worldwide communion uniting millions of people in more than 160 countries. Anglicanism melds the rich history and traditions of both catholic and protestant Christianity. Anglican congregations bring together vibrant faith in Jesus Christ, a commitment to the trustworthiness and authority of Scripture, the beauty of liturgical worship, and an expectation of the powerful work of the Holy Spirit. Anglican Christians believe that Jesus Christ is Lord and that accepting Him as Savior is the only way to abundant life in the present age and the age to come. Anglican Christians are evangelical Christians. We believe that the Bible is the Word of God and that it has unique authority in our lives. As Biblically-faithful Anglicans, our churches teach the whole Bible and how it applies to our daily lives. We believe that God's love for the whole word, expressed in Jesus Christ, is the Good News that we are called to share with everyone. We are part of a world-wide church of more than 80 million people that grew out of the Church of England. We are united to each other and to the broader Christina tradition by a shared way of worship, church order and the celebration and sharing of the sacraments, especially Baptism and Holy Communion. We believe that the Holy Spirit is active in believers, enabling, teaching, healing, and calling us to love our neighbors and change the World. Church of the Holy Cross is a member of the Anglican Church in North America (ACNA). The denomination unites some 100,000 Anglicans in nearly 1,000 congregations across the United States and Canada into a single Church. It is an emerging Province in the global Anglican Communion. The Most Rev. Dr. Foley Beach is the Archbishop of the Church. How is the Anglican Church in North America governed? The Most Rev. Foley Beach serves as the Bishop of the Anglican Church in North America. Bishops meet together as the College of Bishops. Laity and clergy take leadership responsibility on the Provincial Council and during the Provincial Assembly. To which diocese does the Church of the Holy Cross belong? 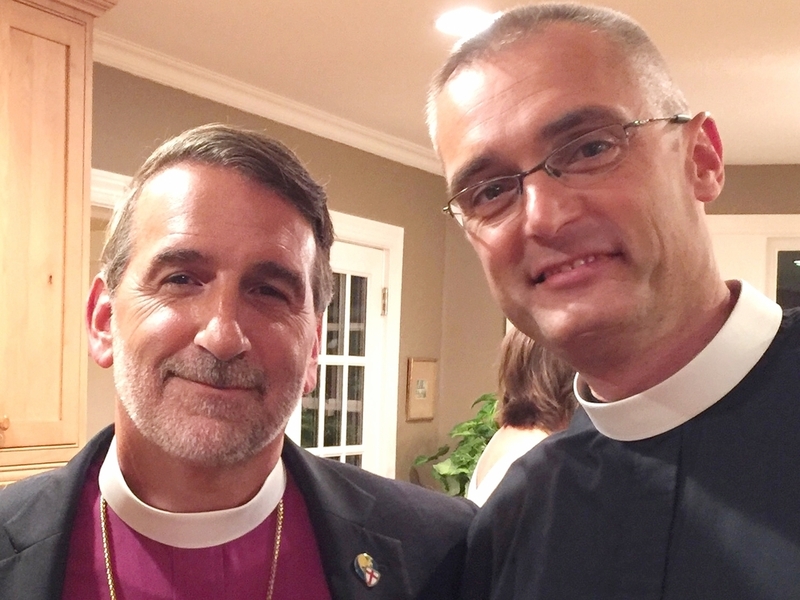 CHC is a member of the Diocese of the Carolinas. Our Bishop is the Right Rev. Stephen D. Wood, who is also Rector of St. Andrew's Church in Mount Pleasant, SC. Go to: http://dioceseofthecarolinas.com/resources/ to read our Diocesan Constitution and Canons. How is a local Anglican church governed? CHC is led by the Rector. All hired staff serve under the leadership of the Rector. The Rector also leads the Vestry - elected members of the congregation who serve for three-year terms. Vestry members are elected at a yearly Annual Meeting and oversee the financial resources of the church and maintain the church building. The officers of the Vestry are the Senior Warden, chosen by the Rector, and Junior Warden, elected by the Vestry. The Wardens are assisted by a Clerk and a Treasurer, who may or may not also be a member of the Vestry. The Book of Common Prayer dates to 1549, when it was first compiled by the Archbishop of Canterbury, Thomas Cranmer. It has been through several revisions over the years; the current edition that we use is the 1979 Edition. About two-thirds of its contents are actually derived from the Old and New Testaments. It includes services for the Holy Eucharist, as well as baptisms, weddings, and funerals. It also contains prayer aids and suggested Bible readings for each day of the year that can be a useful supplement to your own personal prayers when you worship alone or with family and friends. Will I have to say or sign anything, give anything, or be singled out in any way? No. We long for Holy Cross to be a place of safety and refuge. We have ushers who will welcome you, provide you with a church bulletin, help you find child care locations, and answer any questions that you have about our services or our facilities. Included in the bulletin is a card that you may complete and place in the collection plate. The card gives you a chance to ask questions, share special prayer requests (which are shared only with our intercessory prayer team), or ask to be contacted by someone from the church. Rector - Head pastor of a local parish church. Vestry - The ruling board of a Church made up of elected members plus the Rector. Eucharist - Derives from a Greek word meaning “to give thanks”; often used to describe Holy Communion. What about my children? Do they come into the worship service with me? Programs are provided for children up to grade 5 during the worship service. Parents can relax and fully appreciate the primary worship service while knowing that their children are receiving high levels of care and attention. Childcare for children ages 5 and under is available from the beginning of the service until communion when parents are asked to pick up their children in the classroom. Children grades K through 5th are invited to attend children’s worship. The children are escorted out during the song before the gospel reading and are brought back to the sanctuary during the announcements. Why do you offer Communion every Sunday? Can I, or am I supposed to, participate? Any baptized Christian, from any denomination, is welcome to receive communion at Church of the Holy Cross. We celebrate the Eucharist every Sunday to rejoice in Christ's resurrection on the first day of the week. This is actually a practice that dates back to the early Church in the first century. We believe that God's act of reconciliation with us through our Savior is of such importance that it bears repeating each week and on special holy days. Can I be added to the church mailing list without being a member? Yes. Just contact the church office and provide your name and address. Include your e-mail address if you'd like, because informal and late-breaking news is often delivered that way. How can I become a member of Church of the Holy Cross? Periodically, a New Member Class is offered for those wishing to explore the possibility of membership in Church of the Holy Cross. This class presents the vision, mission, and core values of our church and explores our expectations of those who would like to become members. Ultimately, membership in the church is established through the Sacrament of Holy Baptism. Baptismal services are scheduled regularly throughout the year and usually take place during our Sunday morning service. If you're interested in joining the church and have never been baptized, arrangements may be made following completion of the New Member Class. We ask that parents desiring to present their children for Holy Baptism first take steps to establish their own membership in Holy Cross. Those who have already been baptized and have been active in another church, prior to coming here, may request having their membership transferred to Holy Cross after completion of the New Member Class. What is Confirmation? According to the Book of Common Prayer, those baptized "are also expected to make a public affirmation of their faith and commitment to the responsibilities of their Baptism in the presence of a bishop and to receive the laying on of hands." In the Anglican tradition, this rite is known as Confirmation. At Holy Cross, we schedule Confirmation classes prior to a visit from our bishop, which occurs about once a year. Instruction includes a consideration of basic Christian doctrine, standards for Christian living, and resources for Christian devotion. Upon completion of the classes, you can be Confirmed as a member of the church by the bishop during his visit. Confirmed membership is required of those desiring to be eligible to vote at parish meetings and to serve in positions of ministry leadership in the church. I grew up Catholic. Will I be comfortable in an Anglican service? While our beliefs are biblical, orthodox, and reflect the theology of the Protestant Reformation, Anglicans retain some liturgies along with helpful traditions from the early Church that Roman Catholics would find familiar. So, both groups would feel welcome and at home.